Dual waveforms per oscillator. Macros for fast, deep tweaks. Flexible envelope generators. Community presets. Fantastic onboard sounds. Improved filter routing. "We gave the original Curve four stars back at the start of 2011, and it's clear that the developers have been toiling away to improve it since then"
We gave it four stars back at the start of 2011 (read our Cableguys Curve review), and it's clear that the developers have been toiling away to improve it since then, answering our own (few) criticisms and meeting many of the wishes of its users. 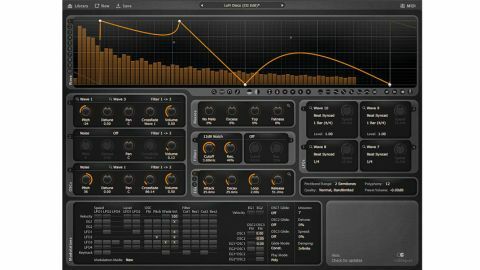 Curve 2 introduces a new look for the synth, as well as a good number of new features and a ton of new sounds - and all at a very reasonable price. Before we look at what's new in 2, though, let's get a brief recap: Curve is a subtractive synthesiser plugin (VST/AU/RTAS), but not specifically an analogue one. Yes, it can do analogue, and very well indeed, but its three oscillators aren't limited to the usual analogue waveforms. Instead, custom waves can be created by dragging (up to 40) points around in the main display to create both straight lines and curves. The bars in the background show you the relative levels of the harmonics in your waveform - this aspect is akin to what you might see on an additive synth, but instead of changing the amplitudes of individual partials (harmonics) to create an abstract waveform, it's kinda the reverse: you design your waveform from scratch, with the display showing the partials of the result. "The formerly flat, whitewashed GUI has been superseded by a groovier charcoal skin that's far easier on the eye"
Right from the start, the changes made to Curve 2 are immediately apparent. The formerly flat, whitewashed GUI has been superseded by a groovier charcoal skin that's far easier on the eye. Much of the interface is familiar, though there are some obvious additions. There are now four user-assignable Macro knobs on display, each of which can be linked to as many as eight different destinations. These assignments are made in a large display area that enables dragging and dropping of empty slots to any parameter on the synth or cell in the mod matrix. Very slick indeed. One macro knob - labelled Fatness - is conveniently pre-assigned in new patches, but you can overwrite this if you like, of course, and, indeed, rename it. The idea here is to allow simultaneous access to swathes of parameters that work well together. For example, you might want to use one Macro knob to modulate one filter's cutoff upwards at the same time as modulating the other's downwards, while also increasing the amount of modulation applied from, say, an LFO to just the second one. Macros can be used as a quick and easy way to personalise a factory sound, or assigned to incoming MIDI messages and used as performance controllers. In fact, mod wheel control is automatically assigned to the first knob, and channel aftertouch to the second, although, again, these assignments are completely editable. "When we reviewed v1, we bemoaned the lack of filter routing. The oscillators in Curve 2 can be routed to each filter individually or both, either in series or parallel"
When we reviewed v1, we bemoaned the lack of filter routing. The oscillators in Curve 2 can be routed to each filter individually or both, either in series or parallel. And Curve's filters sound great - seemingly simple, with only a pair of controls each (Cutoff and Resonance, of course), there are ten modes from which to choose, including 12dB and 24dB variants. There are also a couple of 6dB filters for good measure. It's exactly the kind of arrangement that can allow for massive Oberheim-esque layered patches. As for those oscillators, each of Curve's three can now run two waves at once, and the mix between the two is modulatable. You can select from any of the up-to-ten custom waves saved with each patch, roll your own set of ten, or use a preset noise generator. There's also now a unison mode, for further sonic thickening. Another of our minor complaints in v1 was the very 'standard' ADSR envelope generators on offer. Now you get fully customisable multistage envelopes that can be drawn in the main display, just like the oscillator and LFO waveforms. The exact same node/curve system is used, enabling you to create and drag points on the envelope itself, then drag the envelope around to adjust the curve of each segment. It doesn't behave like most multistage EGs - you can drag one point beyond another, for example - but it's pretty easy to get the hang of. This addition makes a huge difference to the sorts of sounds Curve 2 can make, and nudges it into the same league as instruments costing much more. We should mention that the quartet of LFOs is still as powerful as ever, with the ability to draw upon the same set of ten waveforms that fuel the oscillators. They can, of course, be synced to host tempo with 18 beat divisions on offer. All sorts of triggering options are available, including beat synced, beat retriggered, note synced and more. They can be used in one-shot mode, too, acting as another complex envelope, sharing its waves with the oscillators. While Curve 2 introduces what might at first appear to be only a handful of major new features, they come together to create an instrument many times more flexible than its predecessor, and one that sounds nothing short of magnificent. It's also splendidly easy to use and endlessly versatile, with a truly knock-out preset library. Fantastic stuff.